As with any business, your own membership site needs to offer potential members more reasons to join. 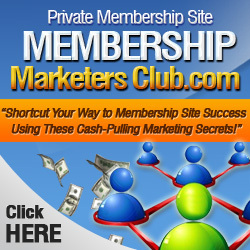 People sometimes need some serious enticing, even if the membership site is perfectly great, offering incredible value. It often takes promotions to get them through the door, just as if you had a brick and mortar business. You can pull in more traffic by using advertising promotions that ignite interest and really get the future member excited about the possibility of signing up for your membership site. And assuming you’ve created a great site, once you get them to try it out, they’ll be so pleased they’ll want to stay. Special deals that will help spark curiosity and interest can include advertising promotions such as giving your new member a month for free, or the first month for a deep discount. You can offer coupons to your potential members through the doors. These coupons could be for access to something that only a coupon holder can get. This could be a special piece of software, or an instructional video that gives detailed information that cannot be found elsewhere on your site. Giving free previews to some of your best content is also a good way to pull in more traffic. Offer up a section of a report or eBook, or an audio report that explains an important, yet little-understood concept, method or solution, as a preview to what your members can expect when they join. Free samples are a fun way to encourage interest in your site, and work much like a preview would. The difference is that a preview will only give a piece of the puzzle and serve to make the prospect curious and interested enough to join up. A free sample is giving prospects something that they can use as it is – this could be an informative article, or a video that illustrates how to do something. People love to get something of value for free, so you can always count on a free offer to bring in the traffic. Remember to use sales and discounts as part of your promotions arsenal. You know how happy it makes you to discover that your favorite store is having a sale. This works for membership sites, too. Offer sales on memberships, such as two for the price of one (that could be two members for the price of one, or two months for the price of one, and so forth). You can also offer discounts on the membership fee. With discounts, you can give your new members the first month at a ridiculously low price. By the time the month is up, they’ll be hooked, provided your membership site is top-notch! Or you can offer the first few months at a moderate discount and then go to the regular membership price after that. Again, by the time the discount period has expired, they’ll love your membership site and be willing to pay the higher price to stay with it. Never underestimate the value of promotions to bring more traffic your way. People love to get a deal – especially on something that they just know is going to make some sort of positive difference in their life.